Is the Doom Trade Over? 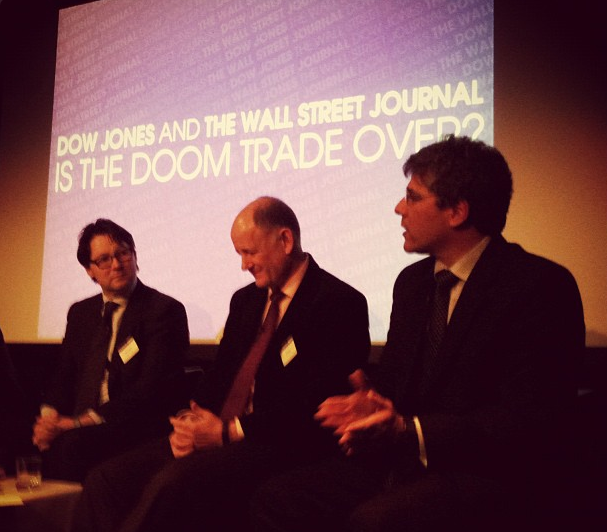 A big thanks to the Wall Street Journal and Dow Jones for having a few of us from Caplin to Thursday night’s “Is the Doom Trade Over?” event at RSA House on the Strand. We were pleased to see an event themed around the cautious optimism that we’ve recently seen in the markets. Left to right: Paul Lambert (Insight Investment), Kit Juckes (Societe Generale) and David Bloom (HSBC). With the Euro crisis far from over and much of the region’s economy still mired in recession, political instability and social tensions could yet throw a wrench into efforts to stimulate growth. Will 2013 see a resurrection of euro breakup fears or is the market likely to come to see the euro as a currency that’s here to stay but that should more clearly reflect its troubled regions fundamentals? And if Europe is not the big risk for this year….what is? So, were the doomsayers plain wrong? David Bloom (Global Head of Foreign Exchange Strategy, HSBC), Kit Juckes (Chief FX Strategist, Societe Generale), Paul Lambert (Head of Currency, Fixed Income, Insight Investment), and Paul McNamara (Investment Director, GAM). Sadly, as it turned out, most of the panel predicted impending doom and gloom and all agreed that we are not out of the woods yet. So, why are some people feeling better? According to the panel, much of the perceived optimism in the markets right now is down to the 2% QE growth in the US. While the stock markets did rise slightly in response to this, it has not reduced high unemployment. The 2% growth may simply be a distraction from what several of the panelists saw as the simple truth of the matter: The perceived optimism is rooted in the fact that things aren’t worse than we thought they would be by this point in time. Optimism came up short when looking at the doom trade from a UK point of view. We heard: “It’s hard to have a strong view on positive growth anywhere. We aren’t doomed, but there isn’t necessarily positive growth” and “we shouldn’t pretend we have recovery – we are simply staving off disaster.” Conversations surrounding the use of QE in the UK secured equally negative reaction and agreement that QE is the wrong policy for the UK. Should we be worried about the results of the Italian election? Comments included: “The Italian election results are making Europe less stable and won’t make the take of re-balancing the Euro any easier” and “This is a country that has had 62 governments since WWII – should we be surprised at the election results? Financial markets have lost their way, but the Italians are doing what they always have”. The panel agreed the Euro will come down this year and that Europe is doomed to an unsustainable economic path if it doesn’t change course. On a positive note, the entire panel agreed that IF the Euro survives, it will become a strong currency. This was a big “if”, however. On sterling, we heard everything from “the pound is buggered” to “sterling is weak, but not that weak – the the pound will go down a bit more, but not that much. From a historical perspective, it’s not really that bad”. We were reminded that unlike other countries in Europe, the UK will devalue, but can’t default. We were disappointed (though not surprised) to confirm what we’d expected to be the case amongst panelists regarding the doom trade but left the evening chuckling to the last sentiment expressed by the panel: Growth, in the very least, is more likely than alien invasion and at some point this doom trade will reach an end. Until then, for us it’s business as usual.